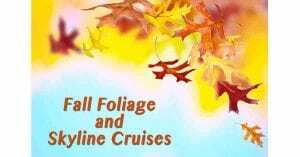 One of the most spectacular times to be in the New York area is right now, and some of the most breathtaking views of fall foliage can be seen on a Skyline Cruise. There is nothing more beautiful than watching summer change into autumn in New York City, Long Island, Westchester and Connecticut and Skyline can give you a front-row seat during your dinner cruise in NYC. Whether you’re looking to cruise the East River from Skyline’s home port at the World’s Fair Marina, or a lighthouse and mansion tour of Long Island Sound, we have public and chartered cruises that will make it an autumn to remember. Foliage season varies due to a number of climate conditions, but generally, in New York City and Long Island, the peak comes in the last week of October and the first week of November, according to AAA. It may be a bit earlier in Westchester and Connecticut with AAA and the Connecticut Department of Environmental Protection putting peak foliage in a window from mid-October through mid-November. To keep up to date, the I Love New York website posts and updates a foliage tracker throughout autumn. But even if you miss peak season, the leaves do change at various times in October and early November, so it’s a good bet you’ll see some incredible sights. If you cruise Long Island Sound you’ll see beautiful colors on the north shore of Long Island and the Connecticut coastline as well as historic lighthouses and other memorable sites. Our lighthouse brunch cruises pass by the Execution Rocks, Sand Point and Stepping Stones lighthouses. Other sites you’ll see include Fort Schuyler, Fort Totten, The Kings Point Merchant Marine Academy, the Throgs Neck and Whitestone Bridges as well as the mansions of Long Island’s gold coast all against the backdrop of a wide array of color. Skyline’s lighthouse dinner cruises leave from Norwalk, Connecticut and pass the Pecks Ledge and Greens Ledge Lighthouse in Norwalk Harbor. In addition to the World’s Fair Marina, we have departures from Port Washington and New Rochelle for your sightseeing tours. People don’t always think of leaves changing color when you think of cruising near New York City, but there’s plenty of foliage mixed in with the world’s most iconic skyline. After departing Flushing Bay, you’ll head past Randall’s Island Park and onto the East River. You’ll pass Carly Schurz Park and Gracie Mansion, the historic 18th Century home that serves as the official residence of New York City’s mayor. As you head down the river towards the skyscrapers of Midtown you’ll pass the tree-lined promenade that adjoins the FDR Drive as well as Roosevelt Island’s Four Freedom’s Park. You’ll continue towards lower Manhattan passing underneath the world famous Brooklyn Bridge which will be framed by fall colors as you sail past Brooklyn Bridge Park. This will bring us to the tip of Manhattan and some of the most beautiful urban scenery in the world: Manhattan’s Battery Park, Governor’s Island, Ellis Island, New Jersey’s Ellis Island, culminating with Liberty Island and your chance to see Lady Liberty on a majestic autumn day. And you don’t have to worry if it’s a bit chilly on the day of your cruise. Our ship the Skyline Princess is fully climate controlled for year round parties and events. Our public brunch and dinner cruises sell out fast, but we also offer charters for all types of events. 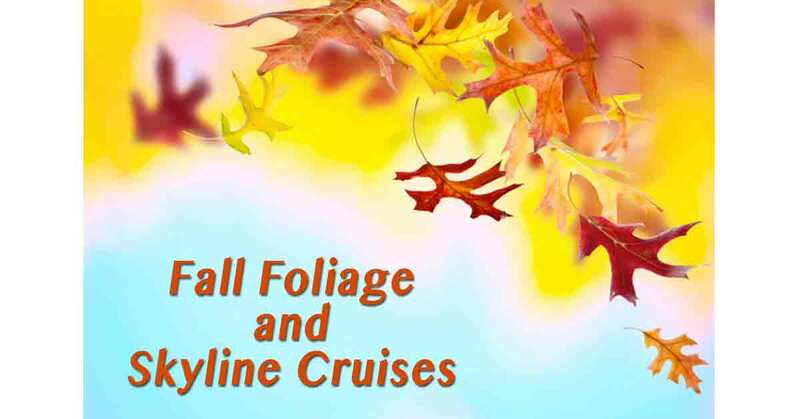 Contact Skyline Cruises today for more information.